The rising carbon emission from chemical processing, oil and gas, power generation and other industries is driving the market growth. Stringent regulation imposed on carbon emission level is generating huge demand for air quality control system. Also, robust industrialization leading to rising in air pollution has increased adoption of air purifying system. This is propelling market growth. Increase in R&D activities for the development of a more efficient air purifying system is likely to project the market growth upwards. The latest report by Value Market Research expects the Global Air Quality Control System Market to reach USD 105.6 billion by 2025. It was valued USD 71.4 million in 2018. The report foresees a 5.75% CAGR from 2019 to 2025. In 2018, fabric filters and electrostatic precipitate has accounted for the highest market share. Rising usage of fabric filters in boilers, incinerators, and generators that are used across various manufacturing industries is driving the fabric filter demand. Followed by, rising governmental regulations to curb carbon emission is fueling the demand for an electrostatic precipitator. Growing awareness regarding air pollution and its potential hazards is booting the segment growth. By application, cement manufacturing led the segment in 2018. Booming construction sector on account of growing development of new residential building, commercial complexes and industrial facilities is driving the market growth. The rise in per capita income, followed by an increase trend of nuclear families are again pushing the demand for construction of residential buildings. Regionally, Asia Pacific emerged as the leading regional market and has accounted for the highest market share in 2018. Growing dependency on non-renewable sources, increasing pollution rate and relatively less efficient existing purification system is driving the market demand in Asia Pacific. Also, robust industrialization coupled with increasing government measures to control air pollution is further fueling the market growth. Some of the prominent players of the market are ABB Ltd, Alstom, Babcock & Wilcox Company, Burns & McDonnell, Foster Wheeler, Hamon Research-Cottrell, KBR, Mitsubishi Hitachi Power systems America and Siemens Energy. 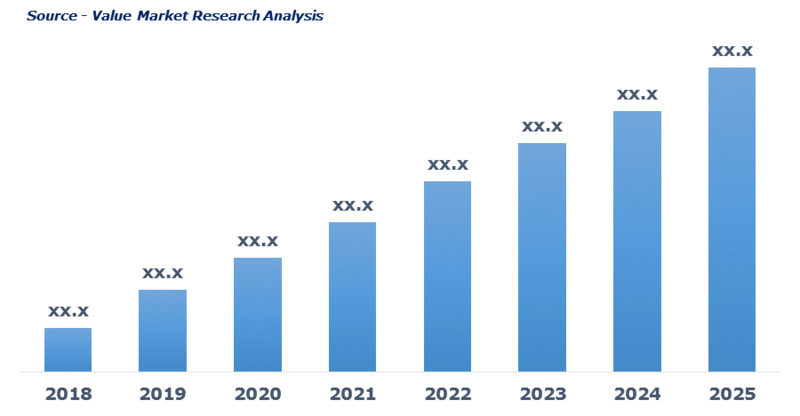 As per this study the Global Air Quality Control System Market was valued USD 71.4 BN (by revenue) in 2018 and is anticipated to reach USD 105.6 BN by 2025 with a CAGR of 5.75%. Air quality control system is the pollution control system that purifies exhaust or flue gases that are emitted during the industrial processes. It purifies the air by removing pollutants such as particulate matter (PM), nitrogen oxide, VOC and other hazardous compounds. The technologies used are flue gas desulphurization, sorbent injection solution, nitrogen oxide reduction, mercury control system, and particulate matter system. The soaring need for power generation to fulfill global demand is driving the market growth. Stringent regulation imposed regarding the emission of hazardous gases and compounds is contributing to market growth. Rapid industrialization and growing concern regarding emission are also some major factors boosting the market growth. Ongoing development in air pollution control technologies is likely to push the market up in the forecasting period. However, shifting trend towards cleaner and renewable energy source may obstruct the market growth. This detailed market study is centered on the data obtained from multiple sources and is analyzed using numerous tools including porter’s five forces analysis, market attractiveness analysis and value chain analysis. These tools are employed to gain insights of the potential value of the market facilitating the business strategists with the latest growth opportunities. Additionally, these tools also provide a detailed analysis of each application/product segment in the global market of air quality control system. The broad air quality control system market has been sub-grouped into product and application. The report studies these subsets with respect to the geographical segmentation. The strategists can gain a detailed insight and devise appropriate strategies to target specific market. This detail will lead to a focused approach leading to identification of better opportunities. Furthermore, the report comprises of the geographical segmentation, which mainly focuses on current and forecast demand for air quality control system in North America, Europe, Asia Pacific, Latin America, and Middle East & Africa. The report further focuses on demand for individual application segments in all the regions. The report also covers detailed competitive landscape including company profiles of key players operating in the global market. The key players in the air quality control system market include ABB Ltd, Alstom, Babcock & Wilcox Company, Burns & McDonnell, Foster Wheeler, Hamon Research-Cottrell, KBR, Mitsubishi Hitachi Power systems America and Siemens Energy. An in-depth view of the competitive outlook includes future capacities, key mergers & acquisitions, financial overview, partnerships, collaborations, new product launches, new product developments and other developments with information in terms of H.Q.